𐀳𐀣𐀂, te-qa-i,[n 1] 破译后读作： *Tʰēgʷai̮s (Ancient Greek: Θήβαις, Thēbais, i.e. "at Thebes", Thebes in the dative-locative case), 𐀳𐀣𐀆, te-qa-de,[n 2] for *Tʰēgʷasde (Θήβασδε, Thēbasde, i.e. "to Thebes"), and 𐀳𐀣𐀊, te-qa-ja,[n 3] for *Tʰēgʷaja (Θηβαία, Thēbaia, i.e. 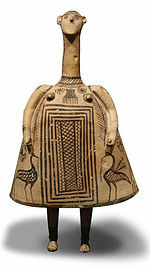 "Theban woman"). 一般可以断定[需要解释]，最初的底比斯是最早的由希腊人建立的、由多个聚居点组成的并具有防御能力的城市，而这为其之后在史前时期中的重要性——也就是军事能力——奠定了基础。狄格·贾科兹（Deger-Jalkotzy）称来自埃及阿蒙霍特普三世时期所建造的祭庙（英语：Mortuary Temple of Amenhotep III）的雕像底座上出现了一个类似“底比斯（Thebes）”的名字。这个名字用埃及象形文字以准音节的形式拼出了“d-q-e-i-s”的字样，被认为是四个较为重要的的亚该亚王国之一的国名（其他之中的两个分别是克诺索斯和迈锡尼）。 *Tʰēgʷai in LHIIIB lost contact with Egypt but gained it with "Miletus" (Hittite: Milawata) and "Cyprus" (Hittite: Alashija). 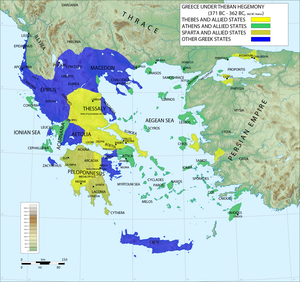 In the late LHIIIB, according to Palaima, *Tʰēgʷai was able to pull resources from Lamos near Mount Helicon, and from Karystos and Amarynthos on the Greek side of the isle of Euboia. ^ 1.0 1.1 1.2 Θῆβαι. Liddell, Henry George; Scott, Robert; A Greek–English Lexicon at the Perseus Project. ^ Πίνακας 3. Πραγματικός πληθυσμός, επιφάνεια και πυκνότητα του πληθυσμού, με διάκριση σε αστικές και αγροτικές περιοχές καθώς και σε πεδινές, ημιορεινές και ορεινές περιοχές. Μέσος σταθμικός των υψομέτρων. (PDF). 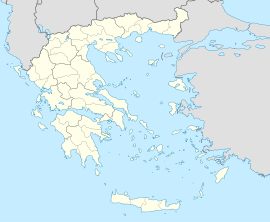 Ελληνική Στατιστική Αρχή (Hellenic Statistical Authority). [11 December 2013] （希腊语）. ^ Kallikratis law (PDF). Greek Ministry of the Interior. August 11, 2010 [June 8, 2014] （希腊语）. ^ 4.0 4.1 4.2 Raymoure, K.A. Thebes. Minoan Linear A & Mycenaean Linear B. Deaditerranean. The Linear B word te-qa-ja. Palaeolexicon. Word study tool for ancient languages. KN 5864 Ap (103). PY 539 Ep + fr. + fr. + fr. (1). TH 65 Wu (γ). MY 508 X (unknown). TH 140 Ft (312). DĀMOS: Database of Mycenaean at Oslo. University of Oslo. ^ Θήβασδε. Liddell, Henry George; Scott, Robert; A Greek–English Lexicon. ^ Palaima, Thomas G. Sacrificial Feasting in the Linear B documents (PDF). Hesperia. 2004, 73: 217–246. Fossey, J., J. Morin, G. Reger, R. Talbert, T. Elliott, S. Gillies. Places: 541138 (Thebai/Thebae). Pleiades. [March 8, 2012].